Copyright © 2005-2008, Kimberly Chapman. All knitting graphics/patterns/instructions on this page were created by Kimberly Chapman. You may link to this page, but please do not steal/hotlink the graphics or copy the patterns to other sites without my written permission. Feel free to print graphics/patterns/instructions for personal or non-profit use, but absolutely no for-profit reproduction is allowed, including selling of finished items (except for registered charitable causes). 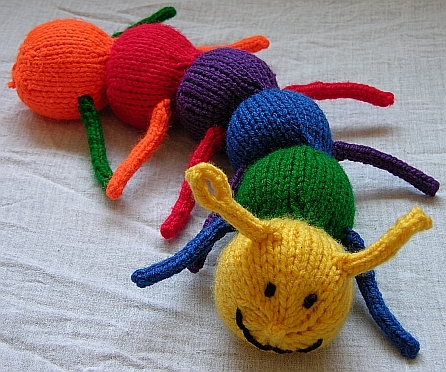 This is a super-simple, very quick toy to knit. It is also very flexible in terms of your choices for length and colours. You could add or subtract balls and use any colours you like in any pattern you like, making it an excellent choice for a gift for a new baby. I've used acrylic yarn for washability, but there's no reason other yarns couldn't be used instead. For a miniature version, please see my Mini Easter Egg Toys patterns. Cast on 6 (2 on each needle). Break yarn and pull through tight. That will give you a single ball. To make the caterpillar, which is a chain of balls, start the ball that will be the back end of the caterpillar (in my pictured example, the orange ball). When reducing down, stop the above pattern just after the double asterisk (when you have 4 sts on each needle). Switch to your next colour, then begin the ball pattern again starting at the single asterisk. Repeat this, stuffing each ball as you go, until you get to the last ball desired (in my pictured example, the yellow ball). Finish the ball pattern to close the head. OPTIONAL ELEMENT 1: to add a bit more of a defined nose to the caterpillar, instead of breaking the yarn and pulling through immediately after the last reduction, knit around once more instead. Then, when pulling the yarn through, shape a little bump out of that extra row and you'll have a nose. OPTIONAL ELEMENT 2: if you want to add any noisemaking elements in the balls, you'll have to do so before making their openings too small to get the noisemaker in. For instance, I put a squeaker in the orange ball and a bell assembly in the yellow ball on mine. Stitch the legs on securely, taking care to try to place them in equivalent places on each ball. If you don't trust your eye to get them even, stick one of your DPNs through the balls at the appropriate points to pick even spots. [Purl backwards 2 on first needle, then knit forward 2] repeat directions in brackets once more. Restart yarn on second needle, then repeat as above to binding off, leaving a tail of a few inches. Use tail to stitch together the ends of the split portion to make a little hoop. As with legs, stitch the antennae on securely and in even locations on the head. Using black yarn (or colour of your choice), embroider on eyes and a smile. I don't know how to crochet myself, so this crochet version was graciously created and donated by MelyssaF from Ravelry. For each color change, attach new color and sc 6 around. Color order: Yellow, Green Blue, Purple, Red, Orange. At end of last body segment (usually orange), sc2tog around (3) and then sew end together. Tuck in end of yarn. Legs/Antennae: Make 2 with each color. With yellow, ch 2 4 sc in second ch from hook sc around 8 rows (this is tricky because the rounds are so small) sc4tog, tie off leaving 8" for sewing to body. For antennae, bend just finished end over 1" and sew yarn end through length of antenna, then sew to top of head. For legs, attach 2 of same color to segments of different color. Face: Use black yarn to make smile and eyes. Page last updated April 10, 2008.